In our quest for uniqueness, we have explored the largest flea markets in India and inspired by its history and aura, we bring to you our very infamous the “Chor Bazaar Live”. A bizarre market flanked by rows of little antique and vintage shops, through jostling crowds and chaotic streets. A Collector’s paradise and a Historian’s fascination – this collection will relive the essence of the Vintage Era. Our new collection depicts the old era in a new light – the images of the old gramophone, classic transistor, paradigmatic type writer etc are shot by our designer at the Chor Bazaar and are then adapted on the new world fashion accessories – laptop bag, jhola bag, coin pouch, sling bags etc. 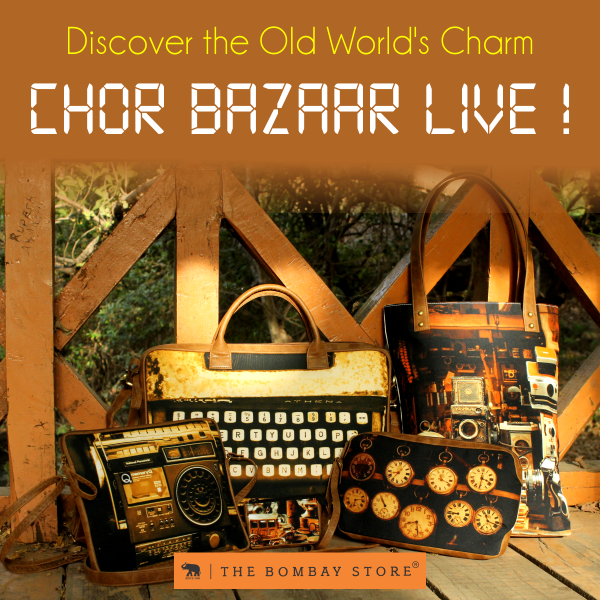 Discover the old world’s charm and flaunt a part of our inexplicable India with the “CHOR BAZAAR LIVE!” – Now showcasing at all The Bombay Store outlets, starting at Rs.295.